If you wonder what the four Americans who were killed Wednesday in Manbij, Syria, were doing there, let me describe a few images from a visit to that city last February that illustrate their mission of helping stabilize this area after the Islamic State group was expelled. Think of a covered market thronged with shoppers: Until the Americans and their allies liberated Manbij in mid-2016, the only color most women dared wear in public was black; now, a rainbow of dresses is displayed on makeshift racks. While the jihadists ruled, people hid their valuable possessions; now, gold sparkles in the jewelers’ stalls. The market is near the restaurant where the four Americans had stopped to have lunch when an explosion took their lives. If you ask what their sacrifice achieved, think of the vibrant street where they died, which was once a monotone of misery. Or take a walk to a girls’ school nearby, and talk to the young women who couldn’t attend classes until the Islamic State group’s power was destroyed by a Kurdish-led Syrian militia, backed by US forces. The girls are wearing makeup and once-forbidden hints of color; one displays a pink hijab and another speaks of someday attending university in France. As you consider these bright snapshots of a city that, with American help, emerged from darkness, you may understand why US soldiers and civilians serving here have been so passionate about their jobs. They could see every day, in nearly every face, the difference they were making. It has been troubling that President Trump never seemed to appreciate how much America was accomplishing in northeast Syria, with so few resources, but maybe he’ll understand better now. Secretary of State Mike Pompeo put it well in his recent speech in Cairo. “America is a force for good in the Middle East. ... When America retreats, chaos often follows. When we neglect our friends, resentment builds.” I hope Pompeo will have an honest talk with his boss about those truths, and what they mean for Syria policy. The four American deaths this week shouldn’t be used as a political club, one way or the other. The reality is that a ghastly attack like this could happen anytime. It’s a miracle that only two Americans had died in combat in Syria since 2015; that number has now trebled. The mission made sense before; it still does. Americans will remain targets for as long as they’re in Syria. But they’ll be even more vulnerable in a pell-mell retreat. The most dangerous military operation can be a withdrawal of forces, like what Trump has ordered. Terrorists will be emboldened, now that they have spilled American blood, and hoping to foster a panicked departure. The Manbij attack carries several obvious lessons. The Islamic State group, while driven from its physical caliphate, is far from dead. Intelligence reports say the group has established “sleeper cells” across northeast Syria that could menace US and allied forces. They’ve created an underground network, waiting for the moment when America tires. It’s clear, too, that coalition forces in Manbij were distracted from the Islamic State group because the more immediate danger there came from Turkish-backed opposition groups. These pro-Turkish groups have assassinated or attempted to assassinate several leaders of the Manbij Military Council, the US and Kurdish-backed group that’s trying to stabilize the city. Worried about Turkish threats to attack, the local security forces couldn’t concentrate full time on IS. Turkey’s obsession with the supposed Kurdish terrorist menace may have helped put US forces at risk. Wednesday’s tragedy should send a message to Ankara, as well as the White House: Stay focused on the mission of destroying the Islamic State group until that job is closer to being finished. As America should have learned, IS is like a cancer that hides in cells and bones and tissues, not quite extinguished. The moment you think it’s gone, it pounces back, hungry as ever, devouring the healthy organs. American troops shouldn’t stay in Syria forever; Trump is certainly right about that. But he needs to be as careful about how the US leaves Syria, or any other Middle East battlefield, as his predecessors were sometimes reckless about getting in. For now, Trump should give US commanders what they need in Syria: a small military force to sustain a clear, consistent US policy of destroying what’s left of the Islamic State group -- and protecting our partners. If a resurgent IS were able to drag the newly thriving markets and schools of Manbij back into darkness, that truly would abandon the sacrifices Americans have made there. 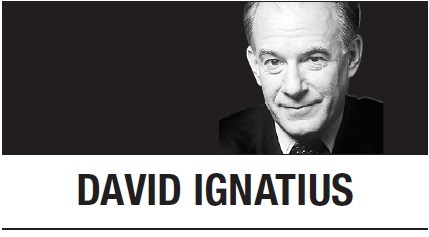 David Ignatius’ email address is davidignatius@washpost.com -- Ed.